Free Shipping on orders over $35 to the continental USA! Case of 1000 BCW Current Comic Book Bags. Each bag holds one current / modern age comic book. Also works for most bronze age comic books. Packaged as 10 packs of 100 bags per pack. 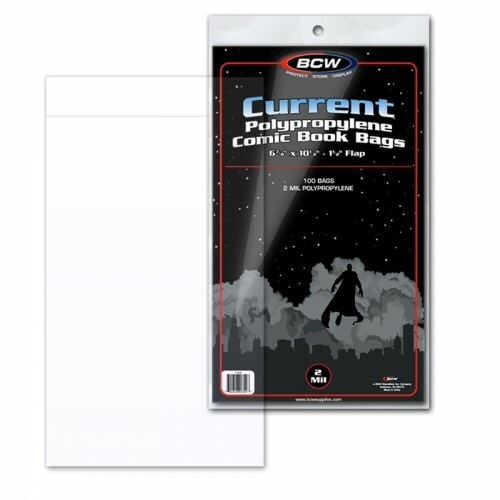 BCW Comic Bags are an acid free, archival quality product made of crystal clear polypropylene. Safe for long term storage of your collection. These are NON-RESEALABLE, which means they require tape (not included) for closure. Do you have any questions about Case of 1000 BCW Current Comic / Modern Book Acid Free Poly Bags?